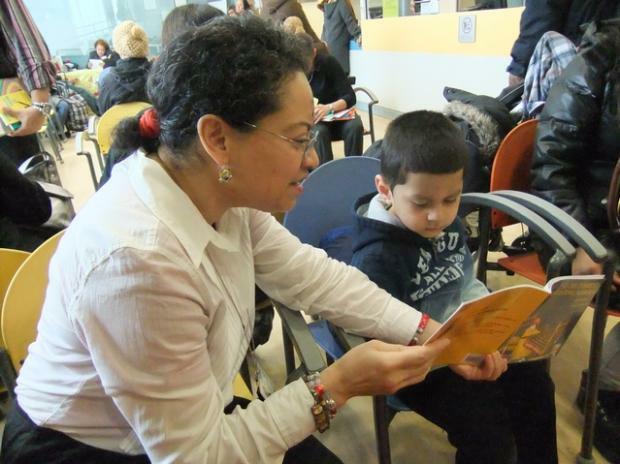 WASHINGTON HEIGHTS — Rhymes, riddles and fairy tales joined stethoscopes and scrubs on Wednesday as volunteers, parents and children at New York-Presbyterian Hospital's family health centers across Washington Heights and Inwood participated in World Read Aloud Day. The volunteer program was devised by LitWorld, a nonprofit organization that advocates for global literacy. The organization set a worldwide target of 774 million minutes to be read aloud by midnight, in honor of the number of people around the world who can neither read nor write. Dr. Dana Serota, a research fellow in pediatrics at NY-Presbyterian and an associate board member of LitWorld, organized the event at four of the hospital's clinics in Washington Heights and Inwood as a celebration of the local community's achievements in fighting illiteracy. "This neighborhood is unique," she told DNAinfo at the Washington Heights Family Health Center on West 181st St. "It's a landing ground for recent immigrants, which means many residents don't have great reading skills to pass on to their children. It can be dangerous: I've had patients too embarrassed to admit they can't read, who then misunderstood instructions on their medicines." But the reading program is nothing new at NY-Presbyterian. Since 1997, staff there have been involved in Reach Out and Read, a national initiative to encourage literacy for children under the age of 5. On each visit, community volunteers read with child patients before their appointment. Doctors then advise parents on how to promote reading at home before giving the child a free book to take home with them. In 14 years, clinics in Northern Manhattan have distributed over 18,000 books to children at medical checkups. "The scheme makes us parents realize the importance of reading," said Delfina Osorio, whose 3-year-old son Diego participated in the program Wednesday, "Now I try to read a little each night with my child." Presbyterian"s Reach Out and Read program director Dr. Mary McCord said "As pediatricians we're focused on child development. We advise caregivers on the best way to support their children"s language skills...This isn't just handing out books like doctors used to hand out lollipops." According to Dr. McCord, many local residents who are now parents were not read to when they were young. Reach Out and Read sessions show them that reading together helps develop the relationship between adult and child. Volunteer reader Henry Carmona, a father of three, demonstrated this while reading to an 18-month-old patient named Andrew. "You don"t just read the words that are on the page," Carmona said. "You add jokes and ask questions about the illustrations. You get them clapping, cheering the characters along. You bring the book to life for the child." Volunteer Ana Perez said children take quickly to the reading sessions, adding, "They choose different books on each visit. Sometimes I read to them, but now they want to read to me!" Families in Washington Heights and Inwood can find out more about Reach Out and Read from Emelin Martinez, Program Coordinator of Reach Out and Read at New York-Presbyterian, on (212) 305-0901.